His painter name was Sanmyaku In 三藐院（さんみゃくいん）. He was a Momoyama period Japanese courtier and man of letter known as a poet, calligrapher, painter and diarist. He got no legitimate son so that adopted Nobuhiro, born from his sister, as his heir. In his earlier life he named Nobumoto (信基) and Nobusuke (信輔), respectively. In his late period he was known with his title Sanmyakuin (三藐院). In Japanese calligraphy he is distinguished as one of the Kan'ei Sanpitsu (寛永三筆) or "Three Brushes of the Kan'ei period," named in imitation of the Heian period Sanpitsu. He is a son of Konoe Sakihisa by a lady of waiting whose name is unknown. 1577 he held his genpuku and was named Nobumoto. Oda Nobunaga led the ceremony and gave one letter of his name 信 (Nobu) to the young noble. Later he changed his name Nobusuke. In 1580 he was appointed to naidaijin, in 1585 sadaijin respectively. He held the position of sadaijin until 1591. 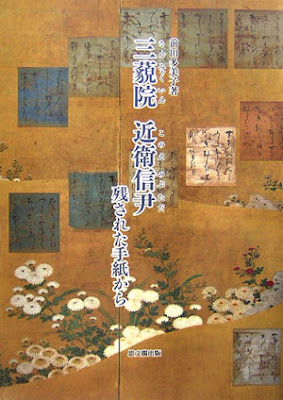 In 1585 he got into troubles with kanpaku Nijo Akizane in relation to Toyotomi Hideyoshi and his planned appointment to sadaijin, the position Nobusuke held at the time of the dispute, today known as kanpaku soron (関白相論). The court meant to appoint Nobusuke to kanpaku succeeding to Nijo Akizane who had been appointed to this position this year. Generally this succession seemed inevitable but those two disagrees in details. Both issued their opinion of letters to the court and the dispute was not settled at the court. Then both visited Hideyoshi to justify each of their opinions. Consequently, Hideyoshi asked for kanpuku position instead of sadaijin which the court had originally meant to give him. For enabling this appointment, since only males of Sekke was considered to be eligible to kanpaku position, Hideyoshi also asked for adoption to Konoe Sakihisa, the father of Nobutada and the contemporary family head of the Konoe, with a promise that Nobusuke would succeed to Hideyoshi as kanpaku. This promise however didn't come true and Toyotomi Hidetsugu, a nephew of Hideyoshi was appointed to kanpaku in 1591. In this year in disappoitment Nobutada resigned from sadaijin and entered into his retirement. Konoe Nobutada (1565-1614) was a famous calligrapher and the head of a high-ranking aristocratic family. Nobutada''''s contributions to the art and culture of Japan have been frequently overlooked, largely because of the common misperception that aristocrats were too outdated, impoverished and powerless to be worthy of discussion. "Dismissed as Elegant Fossils" seeks to reinstate aristocrats as key players in the competition for political and artistic supremacy by examining Nobutada''''s calligraphy and painting, his turbulent relationship with Tokugawa Ieyasu and his family''''s role in marital politics. His work is characterized as "a minimalist in the age of grandeur". One of Nobutada's works, 'Meditating Daruma (Bodhidharma)', depicts Bodhidharma during his nine years of constant meditation in front of a wall at the Shao-lin Temple. I am trying to locate his painting.